Handwritten and hand-painted on glazed (abadi) paper using ink and watercolour. This pilgrimage proxy scroll includes handwriting, painting, and drawing on an expensive yellow glazed paper known as abadi. It is in fragmentary condition and its title, as well as the section containing the basmala (the formula 'In the Name of God, the Compassionate, the Merciful'), are missing. The first of the two fragments includes a pair of standards bearing the name of the contemporary Abbasid caliph, al-Nasir (r. AH 575–622 / AD 1180–1225); the standard on the right is partially preserved. Below this emblem is a colour depiction of Mount Arafat flanked by candlesticks. Below this are depictions of the Maqam-i Ibrahim, a stone associated with the Prophet Abraham, and the water wells. Further below this is a depiction of al-Muzdalifa, where pilgrims spend the night as part of their pilgrimage duties, and al-Mina, which is the third most important site for pilgrims. The empty spaces in between the drawings are filled with inscriptions describing the requirements for the pilgrimage. 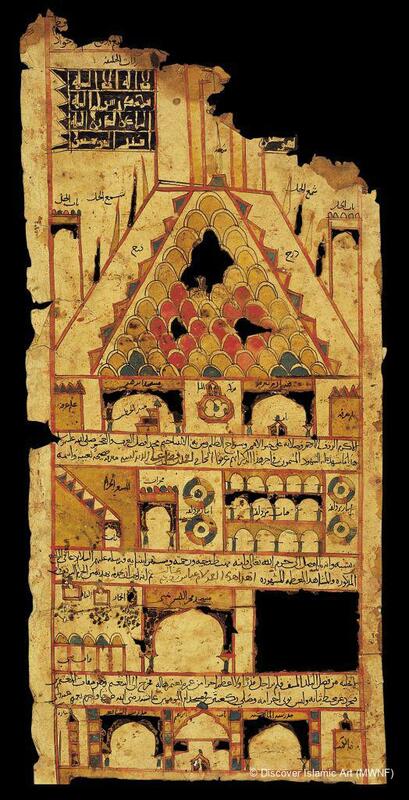 The depiction of the Ka'ba unfortunately has not survived in this scroll. The second fragment features depictions of al-Safa and al-Marwa (two locations that pilgrims visit in Mecca), the city of Medina (where pilgrims visit the tomb of the Prophet Muhammad), the city of Jerusalem, which pilgrims customarily visit after the pilgrimage to Mecca and Medina, and al-Aqsa Mosque in Jerusalem. This proxy certificate was prepared for a person identified as Umm Abbas, wife of Ghalib. The person performing the pilgrimage on her behalf is Ahmad ibn Fadl al-Andalusi. The document was prepared in AH 602 / AD 1206. In the Middle Ages it was difficult for people, especially women, to go on pilgrimage. Therefore, people who went on pilgrimage themselves, and those who sent a proxy on their own behalves, wanted to own a certificate proving that they had visited the holy sites and fulfilled all the requirements for the pilgrimage (perhaps in order to leave them to the future generations). Such pilgrimage and proxy certificates are invaluable documents for they describe the pilgrimage ritual, depict the holy sites, and provide information regarding the social life of the period. Pilgrimage certificates document pilgrimages to the Holy Lands, culminating in circumambulation of the Ka'ba. The certificates or proxy certificates (for those unable to make the hazardous journey themselves) give the names of the pilgrim and the proxy, the places visited and worship performed, accompanied by pictures. The document's inscription specifies the date 602 / 1206. Both the style of writing and the name of the contemporary caliph support this dating. Ismet Bey, the mayor of Istanbul and a member of the board of directors of the Museum of Islamic Foundations (the old name for the Museum of Turkish and Islamic Arts), visited the Umayyad Mosque in Damascus while travelling. 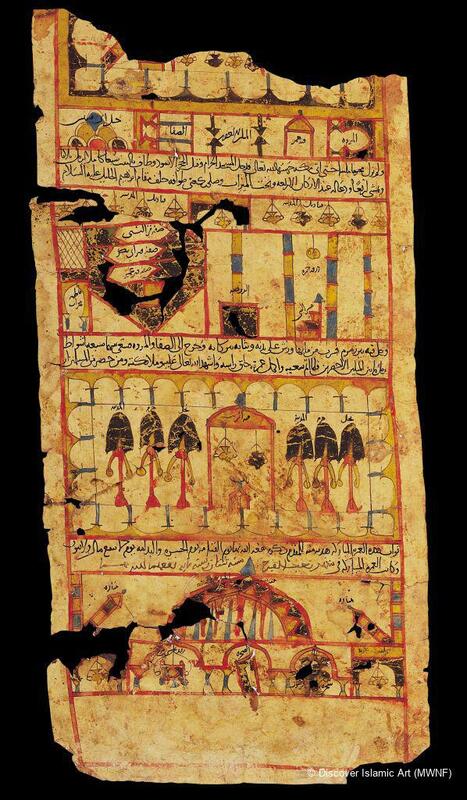 He had a number of items in the Qubbat al-Hazine (Treasury) of the mosque, including Qur'ans and this pilgrimage document, transferred to the Museum where they were registered in the inventory in around 1332 / 1914. Aksoy, Ş., and Milstein, R., “A Collection of Thirteenth-Century Illustrated Hajj Certificates”, M. Uğur Derman 65th Birthday Festschrift, Istanbul, 2000, pp.73–134. ölçer, N. et al, Museum of Turkish and Islamic Art, Istanbul, 2002, pp.80–81. Şule Aksoy is Vice Director of the Museum of Turkish and Islamic Arts in Istanbul. She was born in Istanbul in 1947. She graduated from the Department of History and Art History of the Faculty of Letters, Istanbul University in 1970. She has been working at the Museum of Turkish and Islamic Arts in Istanbul since 1967, first as an expert, then as the Head of the Manuscripts Department until 2003, when she became Vice Director. She has participated in numerous projects and exhibitions organised by the museum and is the author of various publications.